P.K. 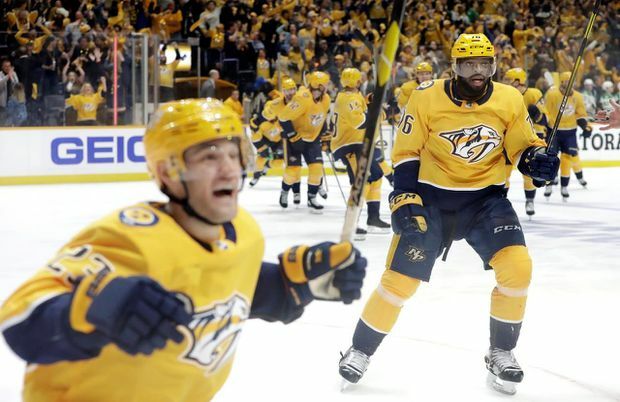 Subban and the Central Division-winning Nashville Predators needed to work overtime just to even things with the Dallas Stars at a game apiece on Saturday, April 13. Subban and the Central Division-winning Predators needed to work overtime just to even things with the Stars at a game apiece, and the Colorado Avalanche got a sudden-death goal from Nathan MacKinnon to tie up their series against the Western Conference top-seeded Calgary Flames. In the East, the defending Stanley Cup-champion Washington Capitals needed extra time to take a two games to none lead on the Carolina Hurricanes, and the Boston Bruins are going blow-for-blow with the Toronto Maple Leafs in series that’s all square and looking like it could be a classic. None of these first-round series are going to be easy — even for the Capitals, who will go into a madhouse Monday for the first Hurricanes home playoff game in a decade. The Capitals will try to keep up the physicality against the small and quick Hurricanes, who have shown they can come back on Washington. Centre Jordan Staal said, “We’re right there,” and there’s no shortage of belief that they can make it a series. Stars-Predators is anyone’s series going into Game 3 on Monday night in Dallas. Each of the first two games was decided by a goal, and players expect the low-scoring trend to continue as the series wears on.